Standard - $224.99 Only 3 left! X-Large - $224.99 Only 1 left! Hanging out in dingy sewers and giving paper boats to little boys wearing raincoats will land you in hot water with the police. (It's neither a sensible or sanitary way to pass the time, plus it's just plain weird.) There's only one entity in existence who can get away with being a sewer-dwelling creeper and his name is Pennywise the Dancing Clown. The demonic killer clown, although evil as sin, has made a career of lurking in the sewers and feeding off the fear (not to mention the actual flesh) of his victims. We don't condone feasting on an arm or turning any appendage into a mid-afternoon snack, but if you're looking for a disguise that allows you to splash around in murky sewer water without raising a few eyebrows, then this grand heritage Pennywise costume will really float your boat. (Pun totally intended). 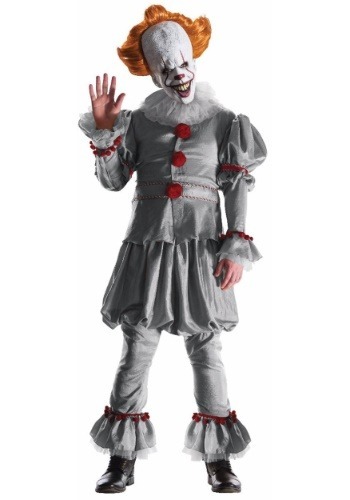 Designed to match its cinematic counterpart, this officially licensed Pennywise costume comes with everything needed to transform you into Stephen King's terrifying creation. Peer out from dark gutters without disapproval once you're suited in the flouncy shirt complete with red pom pom embellishments and lace bell sleeves. 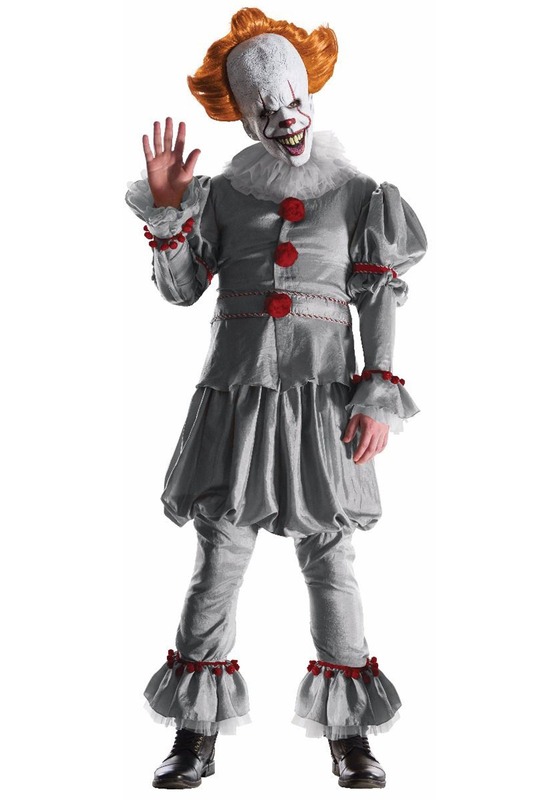 The elastic waistband pants, frilly collar, and PVC vinyl Pennywise mask are all included with this costume and complete your transformation into a horror movie icon. Tie a red balloon to your wrist, crawl into the sewer drain, then give your best unsettling smirk because if you didn't already know, everyone floats down there, isn't that right?